Those of you who read my adventures know that I’m what’s called “reactive.” Reactive dogs like me aren’t aggressive—we’re frightened. 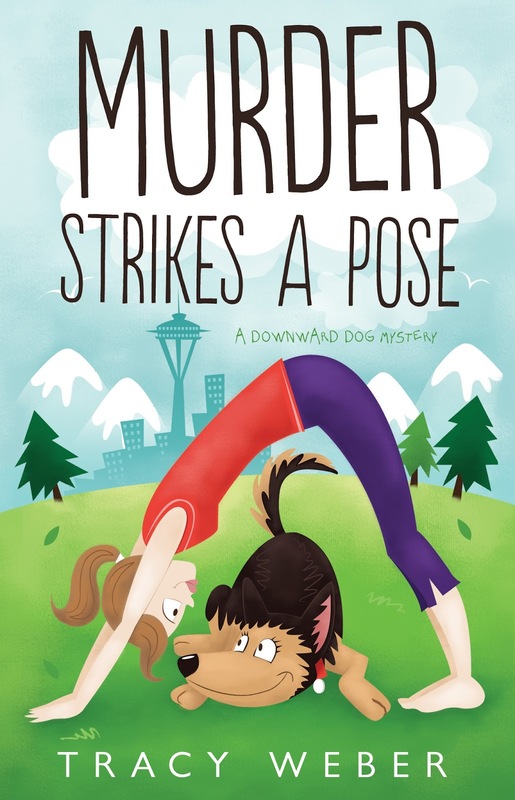 I sometimes bark, lunge, and make a scene, not because I’m mean, but because I want to make the scary thing (which might be you or your dog!) go away. 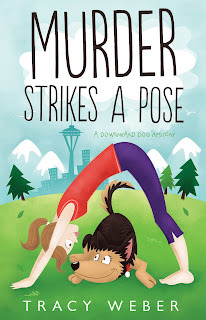 As Kate learned early in Murder Strikes a Pose, walking a reactive dog is far from easy, especially in a populated city like Seattle. Kate thought you might be interested in hearing from me some tips on walking your dog that will help cautious canines like me in the future. So, for your enjoyment (and hopefully education!) here are my Tips for a Successful Dog Walk. Ask before you let your dog approach another dog, even if your dog is friendly. Especially if your dog is “friendly.” You might not know this, but “friendly” in human-speak often translates to “rude and obnoxious” in dog land. I once had a “friendly” dog wrap its retractable leash around my leg. Then it ran away and yanked it. That HURT! I like my vet, but I really don’t want stitches. Ask before you feed me treats. I love treats! I’d eat anything you fed me. And then I might get really sick later. I have a digestive disease called EPI. Other dogs have food allergies. Some foods make my skin break out in sores. Others give me diarrhea. That tiny piece of cheese you give me will make me sick for days afterwards. So that’s about it! Six simple tips that will make your dog walks happy, safe, and fun for you, your pup, and for other dogs like me. Thanks for reading! And if you’re interested in reading my mysteries, check out the link below. Thanks for the tips Bella -- I learned a lot from them. Here is a virtual treat for you if it's ok with Tracy! Yum! Thanks for the treat! I LOVE dog cookies! Bella, You should have been here to counsel my sister's rescue dog. I don't know what that dog's issues were. No one could figure it out. She was so vicious most of the time to other people and then sometimes she was so nice. Finally she bit one too many people. I am sad to say that I have great trust issues with dogs since that and a few other things happened with dogs. Bella, you need to let dogs know that they shouldn't be so aggressive! Most of us aren't naturally aggressive, though sometimes there are dogs that have brain abnormalities. I'm so sorry about your sister's pup. May she rest in peace, and may you someday meet the perfect dog that helps you to trust. I wish we could all speak the same language. So much could be helped that way! I agree, Bella! If only we could speak the same language! If only all dogs were like you! I really enjoyed your column today Bella. I also enjoy your adventures with Kate in Tracy's books. I hope there are many more to come. Thanks! Wait 'til you see what I'm up to in A FATAL TWIST. You won't believe what a good and helpful dog I am!